This is an opportunity to see and experience the art of conscious communication. Imagine looking into somebody and talking to their inner most responses to life. Being able to have a conversation with absolute acceptance. To comprehend the underpinning behaviour and reactions of the human experience of life. All we are and where we're at is reflected in the face. Our structures, mannerisms, and actions are revealed in the Face. 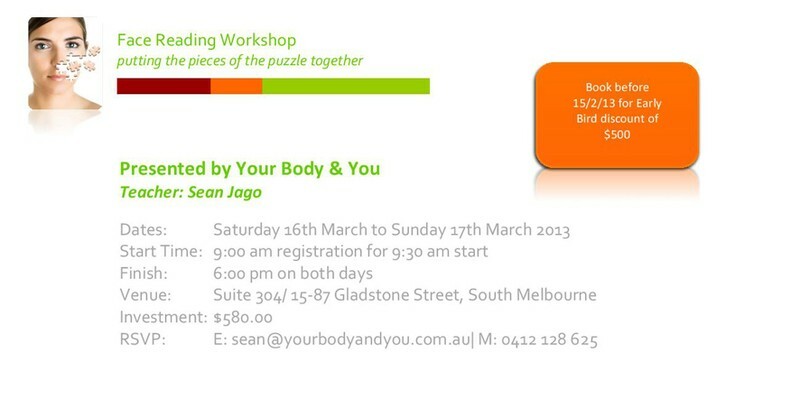 This weekend workshop is to guide you through Psychosomatics in particular the aspect of Face Reading. Such a brilliant way to taste test if the entire Certificate of Face Reading is for you or to simply comprehend life from many perspectives by simply looking into others. The human experience is both sacred and hilarious. It's time to play.